Here are Wordament tips for better scores and getting a higher score in this marvellous educational Wordament game. Wordament game is one of best and challenging educational word games and puzzle games you can play online against hundreds and thousands of rivals. You can download and install Wordament game from Windows 8 Store on your Windows 8 PC, Windows 8 tablet PC or on your Windows Phone 8 smartphone. You will find a few very easy tips and tricks to boost your Wordament score to rank among many others in this Windows 8 app Wordament educational game. Here is the proof displaying how Wordament game tips and tricks boost my game score up to 95% and ranking at 100th place. Do you want to boost your Wordament game score with one simple trick. Here comes your first Wordament tip: use S for plural forms of words found on Wordament board. How easy, is not it? You may double your score simply by also marking the plural forms of the words you have just found. Plural words earn more points and improve your score better than singular form of the words. Both singular and plural forms of the words will add amazing points to your Wordament score. 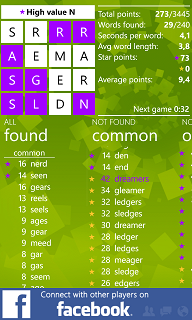 If you check the found and missed words in the above Windows Phone 8 game Wordament screenshot, you will see many plural and singular forms of the same words which definetely boost your Wordament score. When you have found a word on the Wordament game board check quickly for common suffixes first like past tense -ED suffix. Or check for adverb suffix -LY besides -ING form the the verbs of making name article from a verb. For example, you have found adjective HIGH, or FAR for example. Then quickly gaze for comparative and superlative forms of these adjectives. Mark HIGHER or HIGHEST on the board if -ER or -EST forms exist at the end of the alreadly marked word. You can also look for suffixes like -AL, -ER (for producing name from name like jobs), -ES, etc. Besides suffixes, you can also concantrate on prefixes too. You can try to increase your found words and increase the leghth of average words by common prefix structures like -DE, -DIS, -NON, -RE, or -UN. Increase your word capacity especially formed of 3 letters. Because there are many word combinations of these three letters which will increase your rank and boost your performance in Windows 8 Wordament game. When you start playing Wordament game, you will realize you meet with some certain words frequently like TEA, EAT, ATE formed of the same letters in different orders. Next time when you see EAT, even without thinking deeply mark other combinations of these same letters EAT, ATE, TEA, etc. BAT and TAB is an other example. TIP and PIT, TOP and POT or other examples. 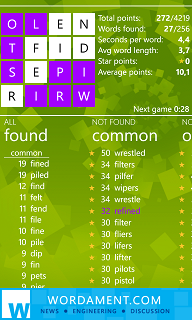 If you are not too successful to find new words in your Wordament Windows 8 game session, do not try to make many guesses one after an other. Because the Wordament game engine is clever enough to understand you are guessing and will punish you by preventing submission of new words for a certain period of time. Although the time you are not allowed to submit a new word is only a few seconds, if you are performing good you will be annoyed with these a few seconds.